And finallyâ¦ The best fifteen Cork footballers never to have won an All-Ireland medal as voted by our website users! Just for fun, we began by asking for your nominees, and then the most frequently-nominated players were put forward for the final vote. This selection does come with a proviso of course â as evidenced by how recently most of those chosen played for Cork, itâs only the best fifteen as voted by a certain sector of Cork fans and is certainly not intended to be definitive! 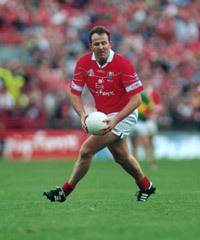 In goals, 1999 All-Star and the holder of four Munster medals, Kevin OâDwyer of OâDonovan Rossa was the undisputed choice, with 58% of the vote. Kevin Kehily (Newcestown), a fixture on the Cork team until his retirement in 1984, and the holder of three Munster titles and two All-Stars, was the choice of 55% of you for the full-back line, followed by two more All-Star footballers, Mark OâConnor (Bantry Blues) and John Evans of OâDonovan Rossa. Also in close contention for the full-back line were SeÃ¡n Ãg O hAilpÃ­n, who was just one percent behind Evans, and Ronan McCarthy of Douglas with 25%. Moving on to the half-back line, Cork selector, multiple Munster medal-winner and 1999 All-Star CiarÃ¡n OâSullivan (Urhan - pictured) was by far the most popular choice, with 78% of the vote, along with fellow Cork selector and contemporary Owen Sexton (Kilbrittain) with 48% and dual star Brian Corcoran, who won three Munster Football titles along with his five Munster Hurling and three All-Ireland medals and collected 41% of the vote. The late Tom Creedon (Macroom) who died so tragically in his prime in 1983, and Martin Cronin of Nemo Rangers were also in contention. Midfield was by far the most competitive position. Fachtna Collins of Ilen Rovers topped the poll, with 41% of the vote, with Bernie OâNeill (Adrigole), who played on the 1967 and 1971 Munster-winning teams, just about shading it for the second spot with 29%. Close behind were fellow 1960s star, Con (Paddy) OâSullivan with 27% and MicheÃ¡l OâSullivan with 28%. Moving on to the half forward line, the choices were fairly clear here. Joe Kavanagh of Nemo Rangers, another All-Star and winner of five Munster titles, claimed 70% of the vote, with Cork selector Don Davis (OâDonovan Rossa) and Adrigoleâs Brendan Jer OâSullivan, all highly decorated players, completing the line-up. Honourable mention goes to Podsie OâMahony of Ballincollig, who was closest to this trio, with 31%. There was really little question about the full forward line from the moment the poll went online. Colin Corkery (pictured), winner of four Munster titles, four Munster Club titles with Nemo Rangers, two All-Ireland Club titles and an All-Star, scored a whopping 89% of the vote. His clubmate and one of the most recently retired players on the team, James Masters, came in with 62%, while the line-up is completed by Philip Clifford (Bantry Blues), with 42%. No-one else came close!! *Some players were nominated in a variety of different positions but were put forward for the vote in the position in which they were most frequently nominated.